To finish this menu of, we will spoil ourselves with chocolate, coffee and hazelnut all in the shape of two version of the traditional French Christmas cake called bûche. 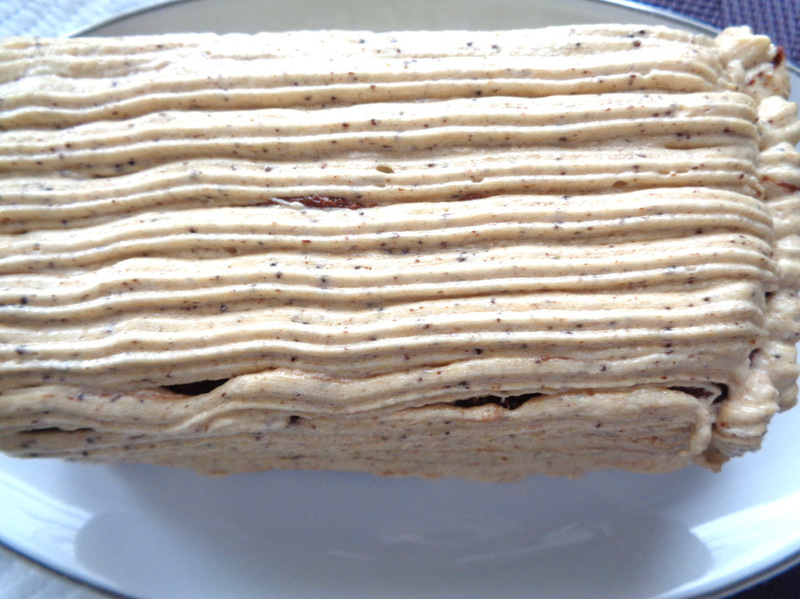 The bûche can be like a Swiss roll or much more imaginative yumminess created in a shape of a log. Caution! These cakes are very very satisfying and RICH enough to make you feel very guilty after each spoon full. Just saying. If these cakes were shop bough, they would cost at least £5.00 each… great as a treat. cost quiet a lot of money, It is much much cheaper to buy them with skin, roast, grind and sieve at home as I did. If you don’t fancy doing that, use ground almond instead. I prefer hazelnut because of its strong flavour. Against the coffee it was fantastic! Once the ground hazelnut is ready, set aside. 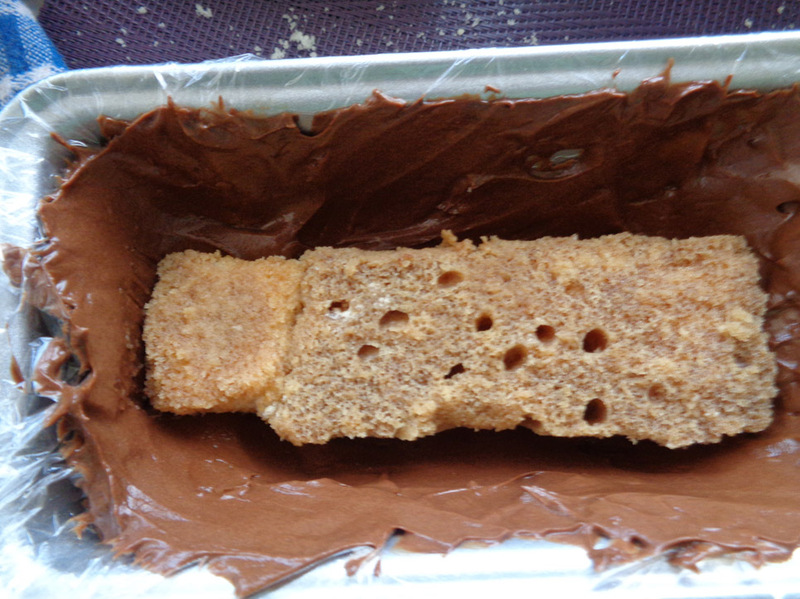 Next remove the “crust” from the Madeira and cut out two mini logs of 3cm x 3cm x 12cm to fit into the baking tin. 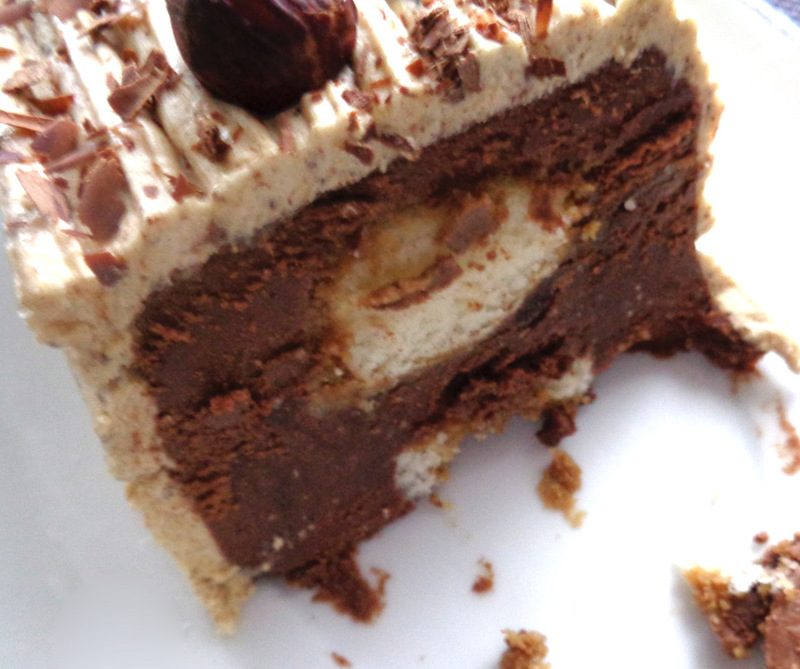 The idea here is to cut the Madeira so it will fit fully in the inside of the cake. So, it should be smaller than the size of the cake tin. Once the Madeira is ready and set aside. 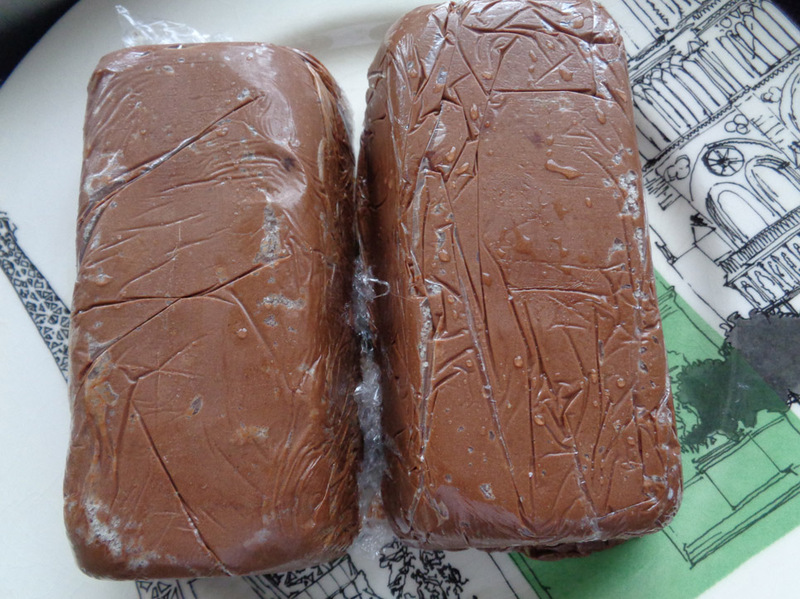 Break 2 and half chocolate tablets (250g) and melt them in a Bain Marie. Set the liquid chocolate aside to cool down a bit. While all this is going on, the double cream should remain in the fridge until it is needed. Dissolve 1,5 teaspoon of coffee in 100ml water, set aside. Now, prepare the cream. 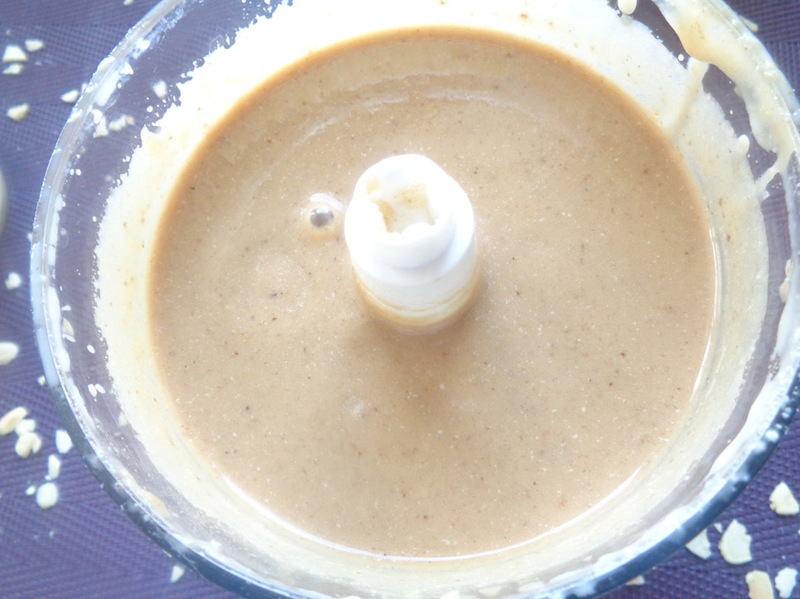 Pour the 300ml of cream in a large bowl with the sugar and whisk until it starts forming picks. 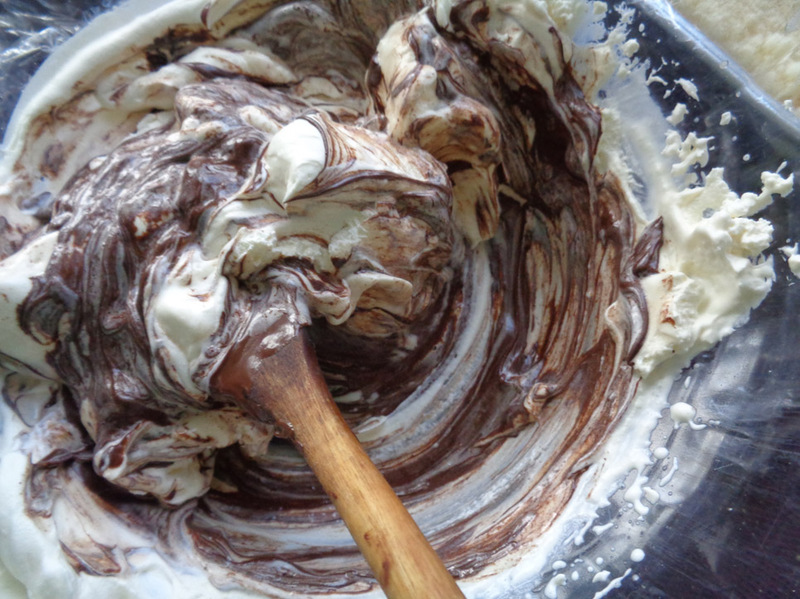 Add to the cream, the melted chocolate and gently fold until the mix become one single and regular colour. Now divide the mix in two. In one half, mix in the ground hazelnut, leave the other half plain. See blow the mix progression. On to the moulds. 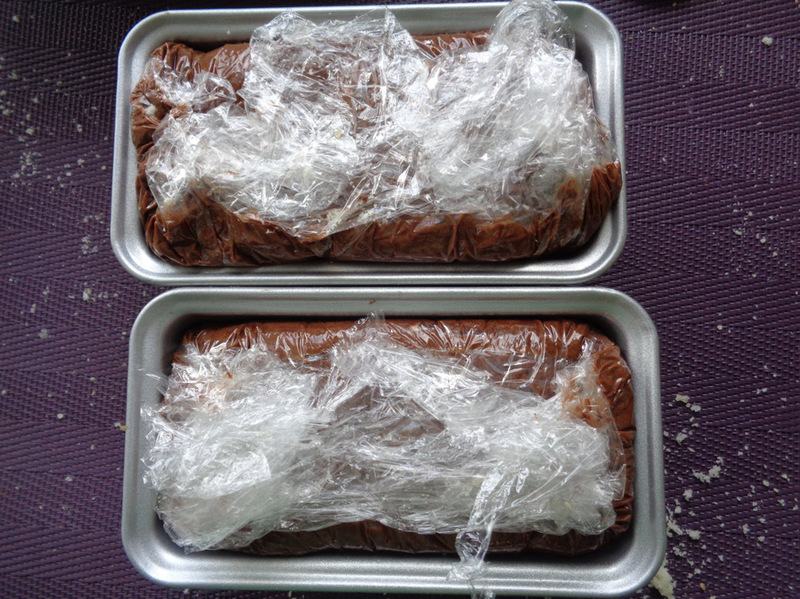 Wet the inside of the cake tins with water and line with cling film allowing about 5cm of film to hang on the outside of the mould. Make sure that the film inside the mould is as flat as possible with no folds or pleats. 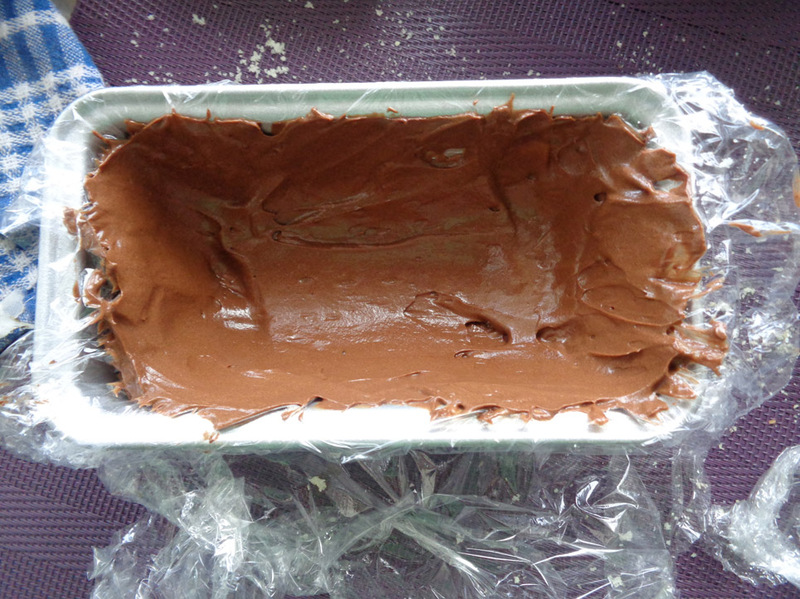 Once the moulds are lined up with the film, spoon in the first layer of the plain chocolate and cream mix. 2 tablespoons of the mix per mould should do. 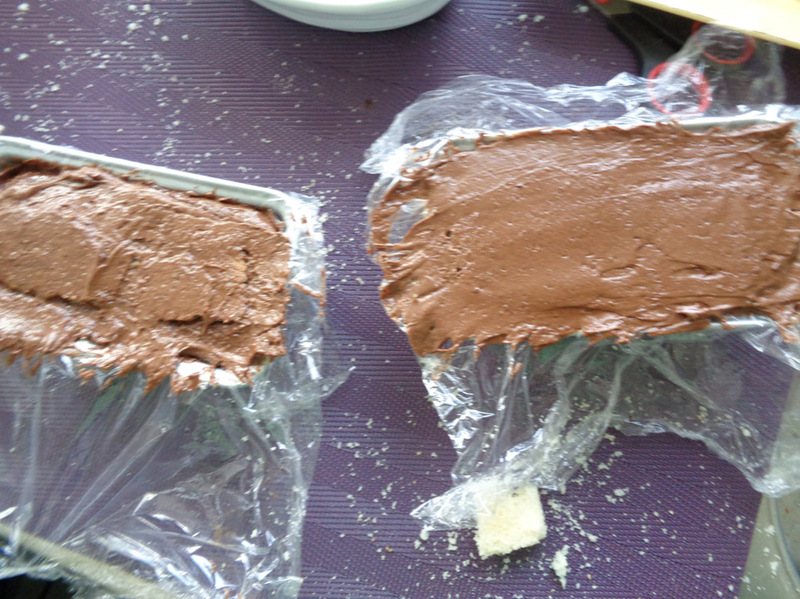 Now make sure to spread the mix evenly in both moulds. Spread on the bottom as well as on the sides. This will help with to shape of the dessert. Once the first layer is spread, dip the Madeira cakes in the coffee and place them on the middle of the cake tins now lined with chocolate mix. 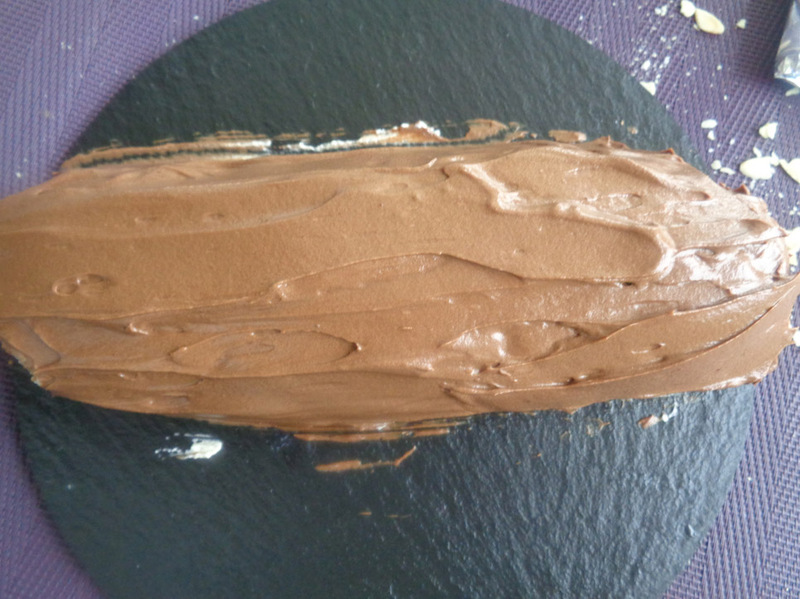 Cover the Madeira cake with the chocolate-cream-hazelnut mix, then tap the tins to allow the mix will fill all wholes. If you still have Madeira cake left, dip it in coffee, place in the tin and recover with the left over chocolate mix until the tin is full. Now bring in the cling film ends hanging on the outside of the tin and fold them over the dessert tightly, then place the both tins in the fridge for 1 hour. Meanwhile prepare the presentation plate for both dessert. 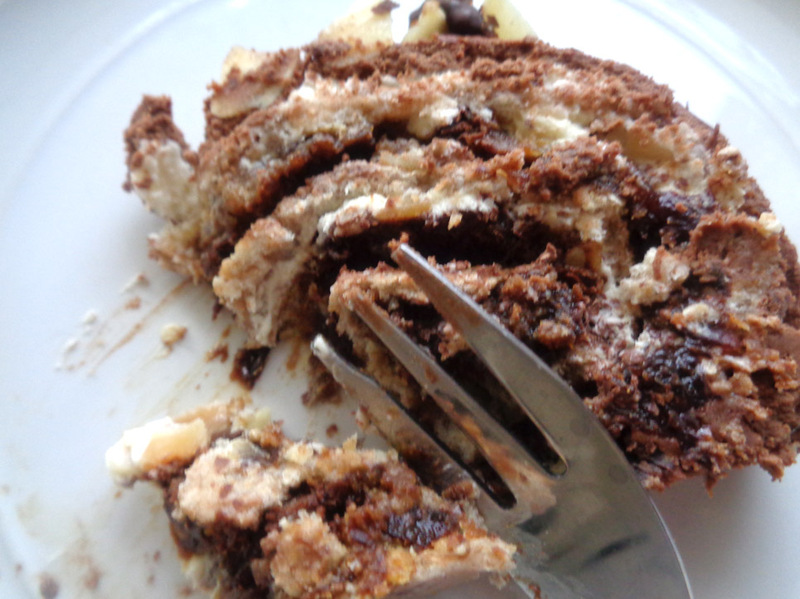 The bûche can be very fragile and it is not advisable to more it around event two minutes. 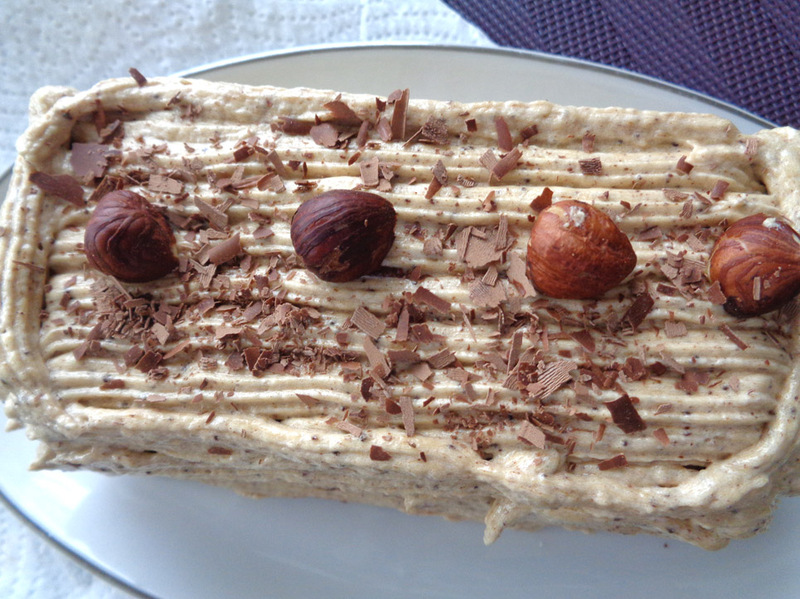 If you are decorating it, it is best to do so as cleanly as possible while the cake is on a presentation plate. Prepare the covering for both cakes. 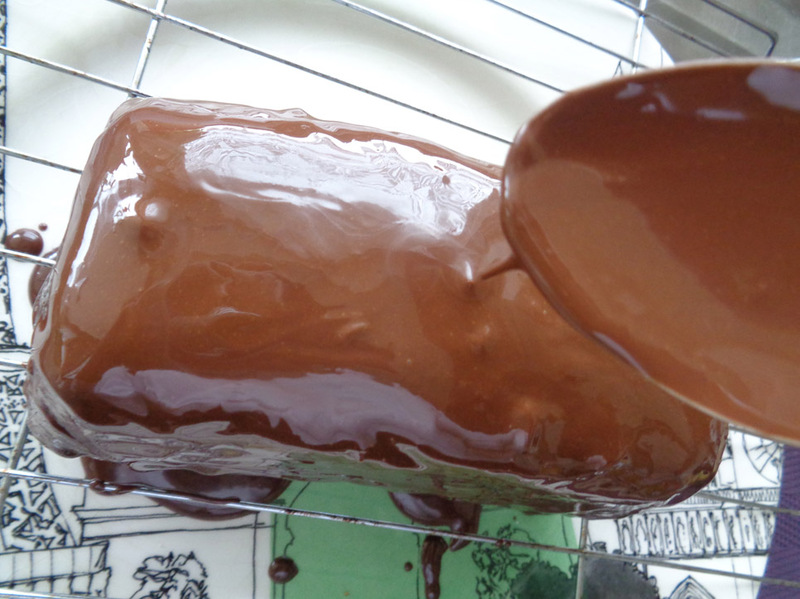 For one, simply melt 50g of chocolate with 20ml vegetable oil or Hazelnut oil if any available. Adding oil to the melted chocolate will prevent it from being too hard to cut with a knife and also give the chocolate a shine. For the second covering, soften 100g butter at room temperature and when it becomes gel like, whisk it to soften it even further with a pinch of salt then sieve in 100g icing sugar as well as 1 teaspoon of coffee granules. Mix well until obtaining a milky coffee colour. Spoon this mix in a piping bags ready to be piped on the cake. Once the desserts have been in the fridge for an hour, take them out and carefully unmould them and remove the cling film. For the first version of the dessert, simply pour the melts chocolate over it, leave to rest for 5 minutes then, pour another layer of the liquid chocolate over it. Leave to rest for 10 minutes then move into a serving plate before topping with broken roasted hazelnut. 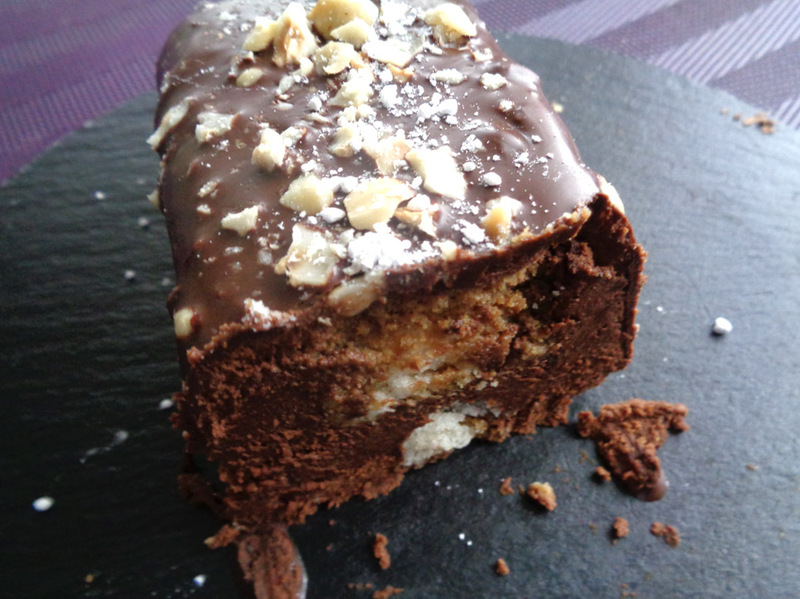 Return the bûche in the fridge for at least 1 hour before serving. 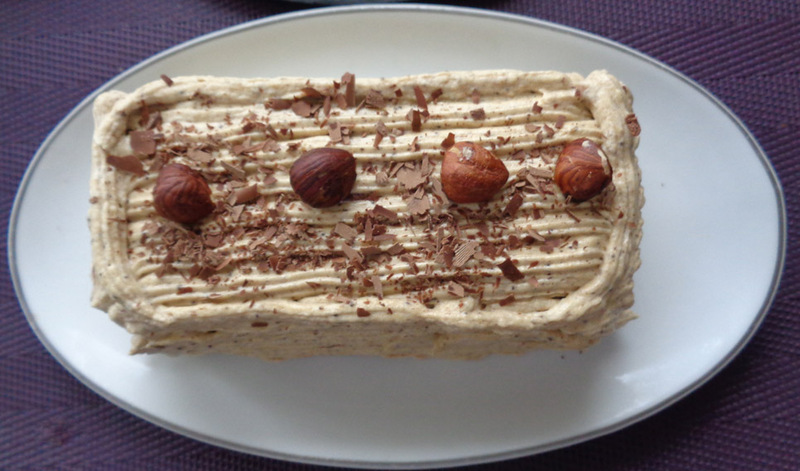 For the other bûche, simply pipe the coffee icing in a pattern of your choice and have fun. As for me, I simply created straight lines to imitate a log. 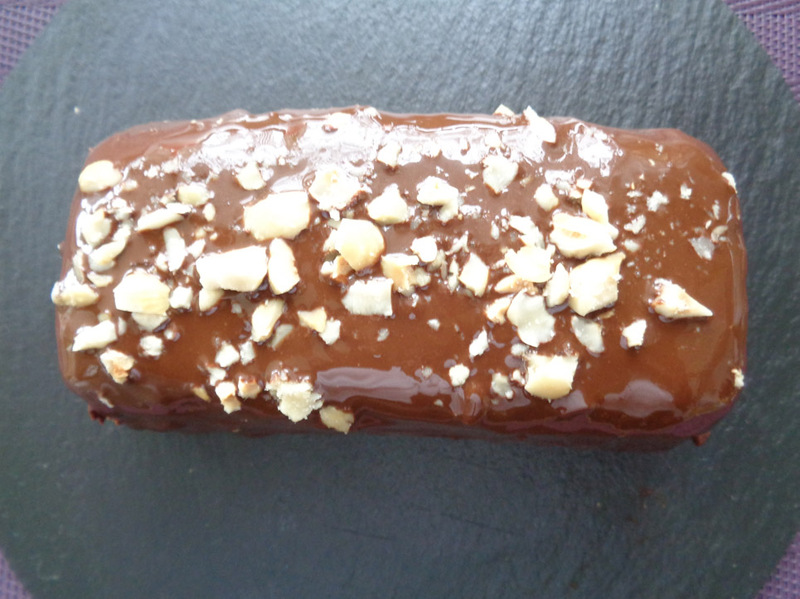 Afterwards, I sprinkled chocolate shaving and topped with whole roasted hazelnuts. I hope you have enjoyed this menu. 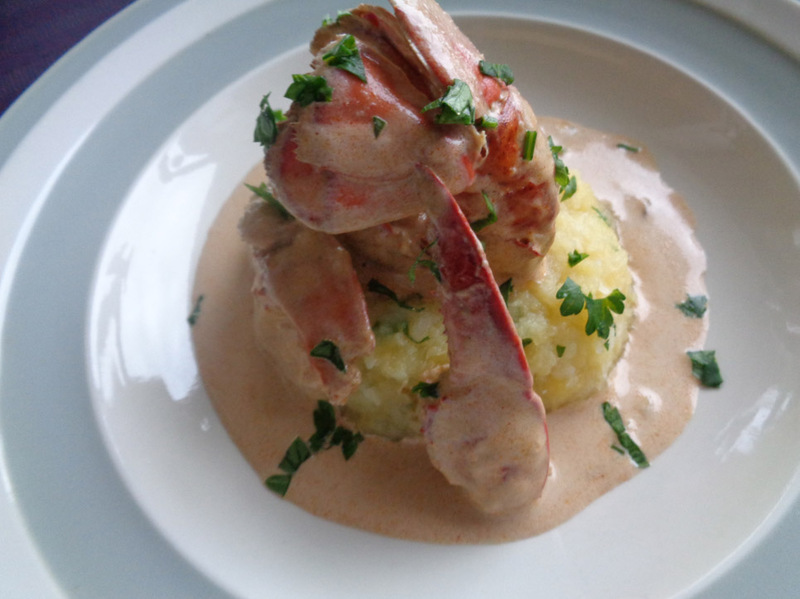 To see my whole Christmas menu for 2, type #NoelByHJ in the search box. 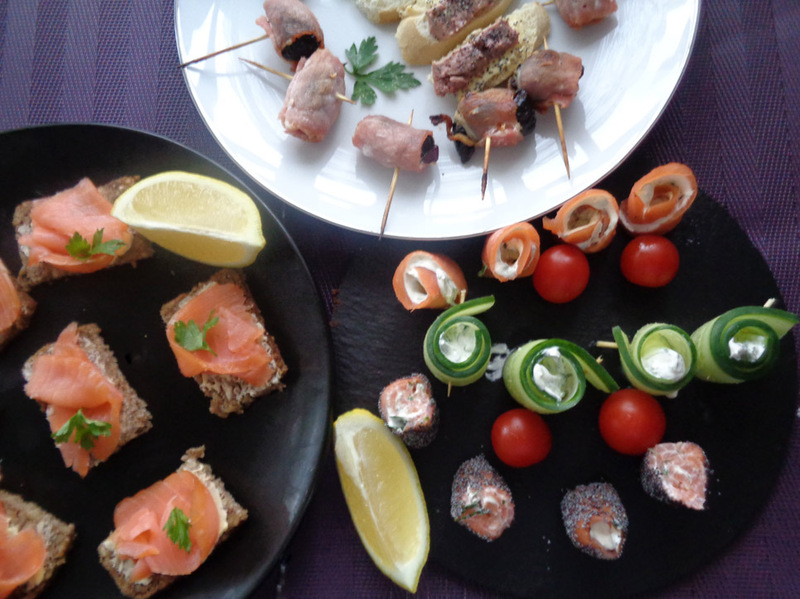 I have also create 9 recipes for the Christmas leftovers if you had turkey with the usual trimmings. Just search #XmasScraps or #ChristmasScraps. Happy Christmas to you and yours. See you in 2016… don’t forget to visit Croydon Radio to listen to the show dated 5th December on the podcast with Tom C.
pudding which would have been left in room temperature to make it easy to mash. On a flat surface stretch out 70cm of cling film, then line the slices of bread as close to each other as possible and as straight as possible. Now spread on all the surface 200g of the shop bought butter cream, a hand full of roast almonds flakes and the mashed Christmas pudding. Make sure to spread all of that across the whole surface of the butter creamed bread. 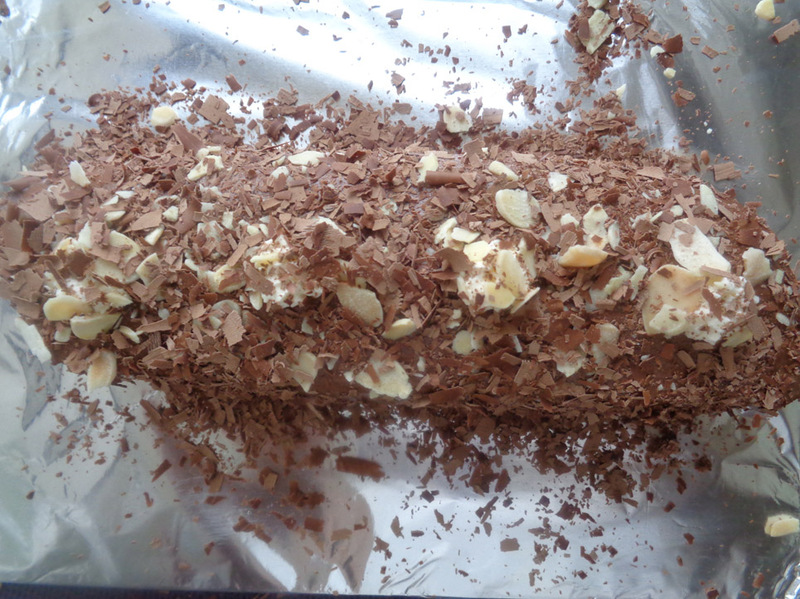 Now using a grater, grate over the mix about 20g of dark chocolate before rolling tightly while making sure that the bread slices remain together and the cling film is not caught in the rolling. 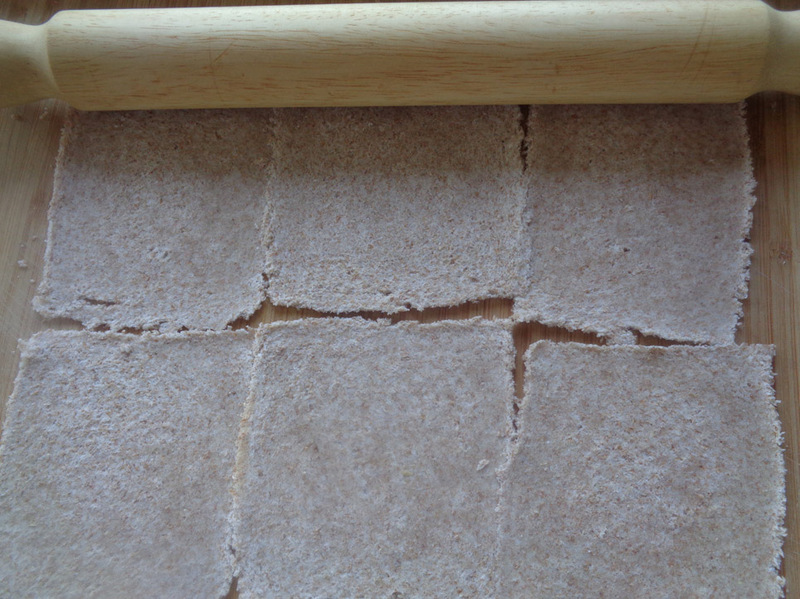 Seal the rolled sandwich very tightly in the cling film and place in the fridge for 1 hour. 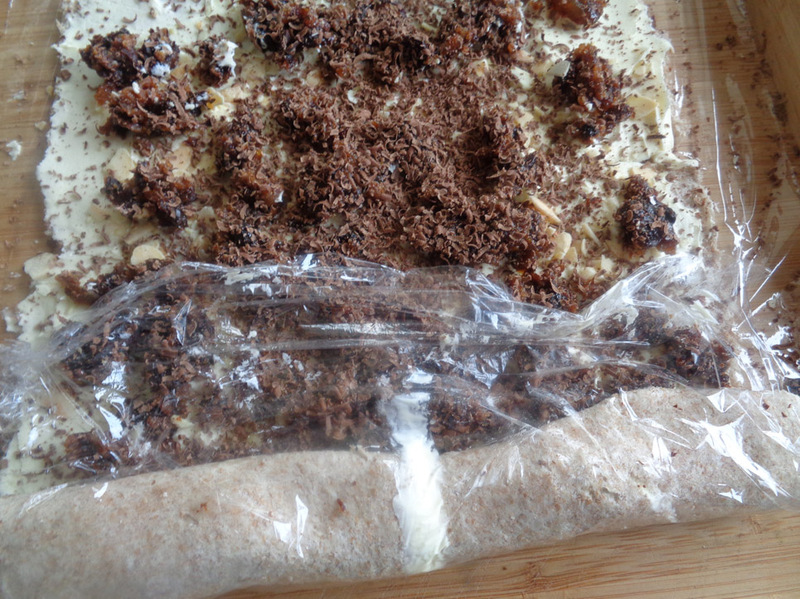 After the hour has passed, bring the log out of the fridge and gently remove the cling film. 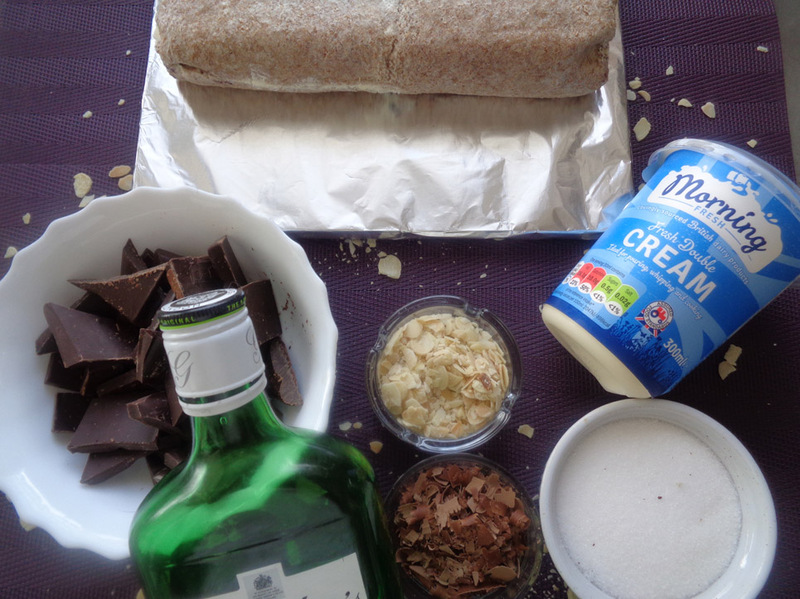 Place the log on a flat surface and moisten the bread with the syrup made out of the gin, water and sugar. Don’t make it too wet. Leave the log aside to absorb the liquid. 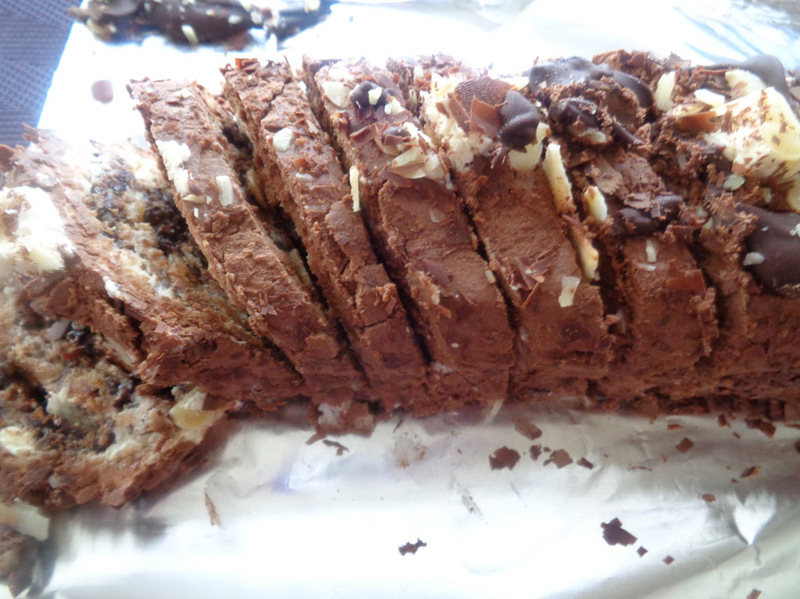 Meanwhile, prepare the yule log coverings: first layer is whisked cream the second layer is chocolate & whisked cream mix. Melt 200g of dark chocolate and set aside. While the chocolate is cooling, whisk 200ml of double cream with 20g sugar using an electric whisk until the cream hardens. 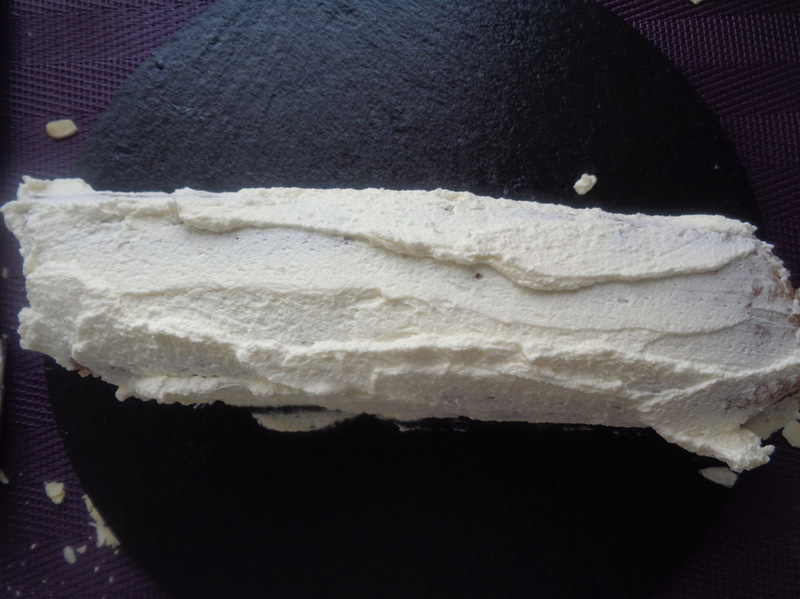 Cover the bûche with 2 layers of the hardened cream. 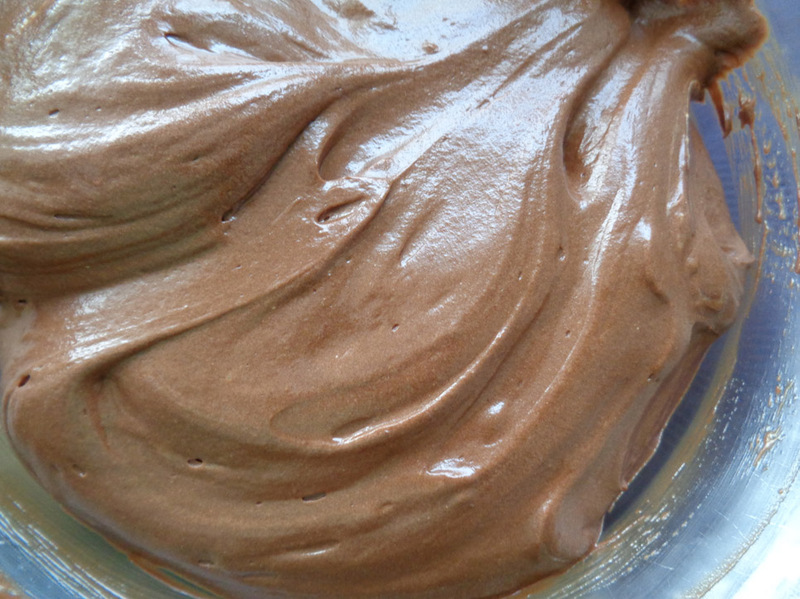 Now pour the chocolate over the rest of the cream and fold gently until you obtain a uniform chocolatey colour. Cover the bûche with the cream until you run out. Now smooth the covering as much as you can while imitating the look of a wood log. 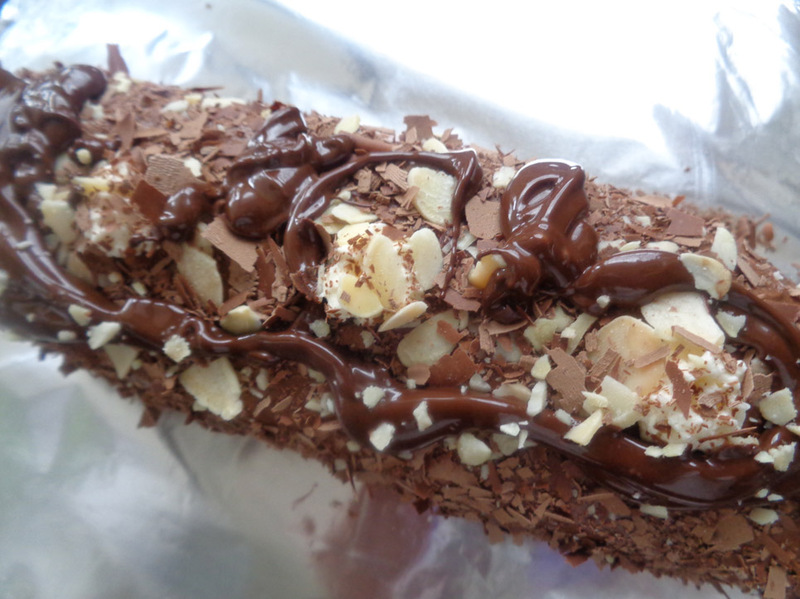 Now decorate with the left over almond and dark chocolate shavings or simply leave it as it is. 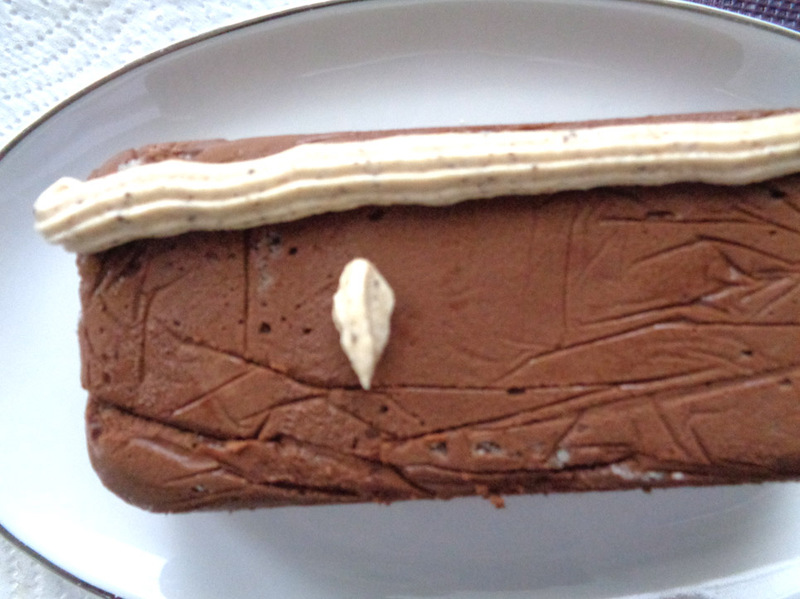 If you are going to decorate the yule log, do it before leaving the cream covering to set. Once the cake is decorated, place it in the fridge to harden for at least 1 hours before serving. Enjoy just as it is. 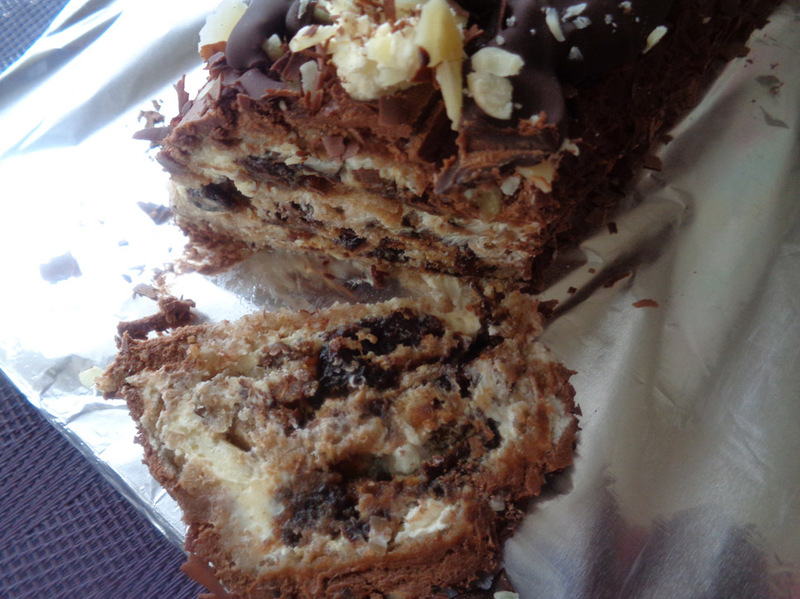 This is a very very rich cake and need no accompaniment! Another idea will simply be to bake a sponge cake with chunks of Christmas pudding! Ooh! 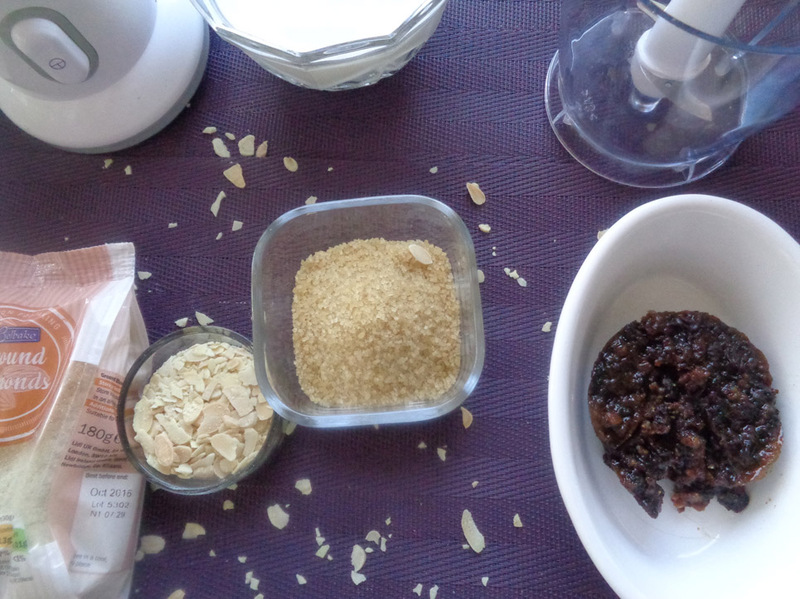 how about making salted caramel with small lumps of Christmas pudding… just go create! To see all the recipes includes in the Christmas leftovers series, please type #ChristmasScraps or #XmasScraps in the search box. 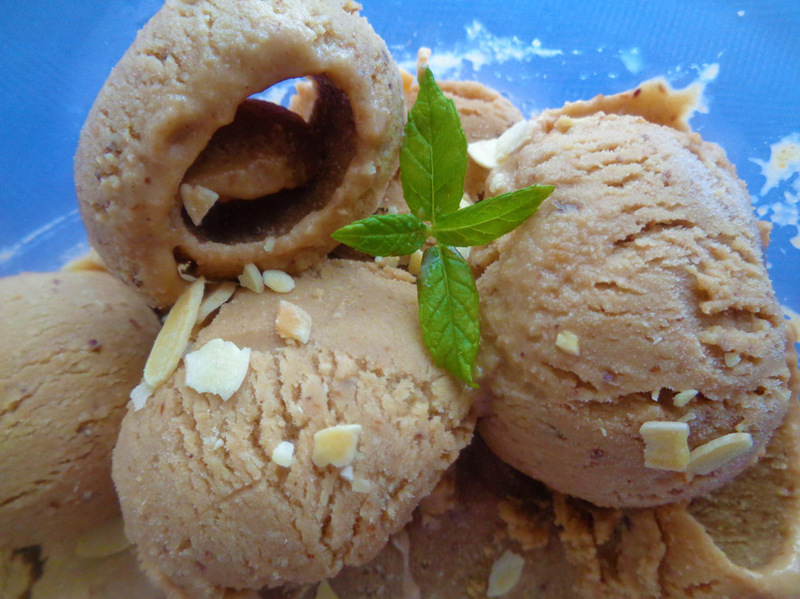 Have you seen the Christmas pudding Ice cream? To see the turkey leftovers see here, here and here. Also check out the leftover mash recipes. Leave the Christmas pudding at room temperature so it won’t be hard to mash. Add the sugar to the milk and stir until there is granules left. 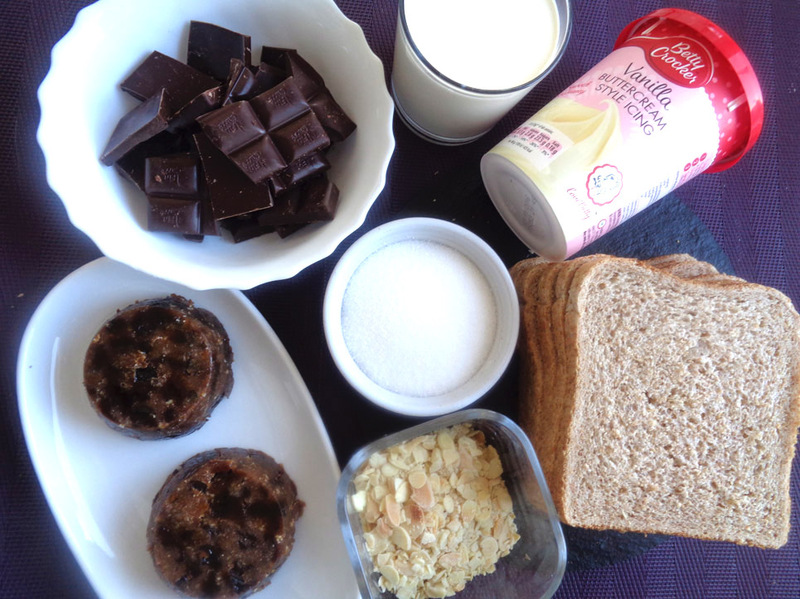 Pour the sugar/milk mix in the blender with the mashed Christmas pudding and blend until smooth. 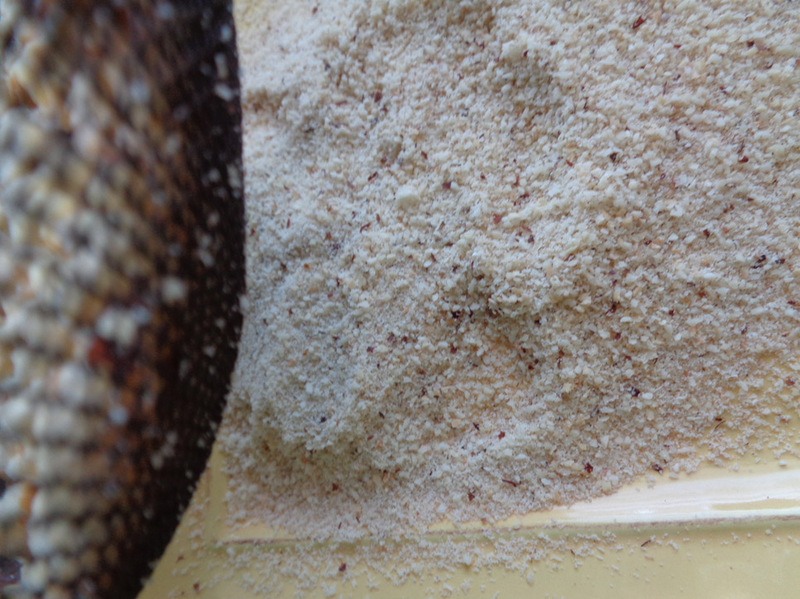 Now add the ground almonds and blend again… the smoother the better. Once you are satisfied with the smoothness of the ice-cream mix, pour it in a bowl with a lid and place it in the freezer for 3 hours. Bring the bowl out of the freezer 10 minutes before scooping. Cost: the unpriced items are regular that should already be in the house. But just as a note, 1LAlpro Soya milk cost £1.35 but can be found in LIDL also at 69p. Alpro is the best for me in vegan milks. Total spent on this recipe to produce 1L ice cream £1.74. Pour the milk, sugar and vanilla pod in a pan and bring to boil. Once it boils and the sugar has dissolved, remove the pan from the heat and remove the vanilla pod. Set aside and leave the milk to cool down. Now cut and destone the peach then cut in small pieces without peeling. Peel the bananas and chop them. Now, pour the milk in the blender with the peach and bananas, then liquidize until very smooth. Now pour the mix in a bowl with lid and place the bowl in the middle part of the freezer. 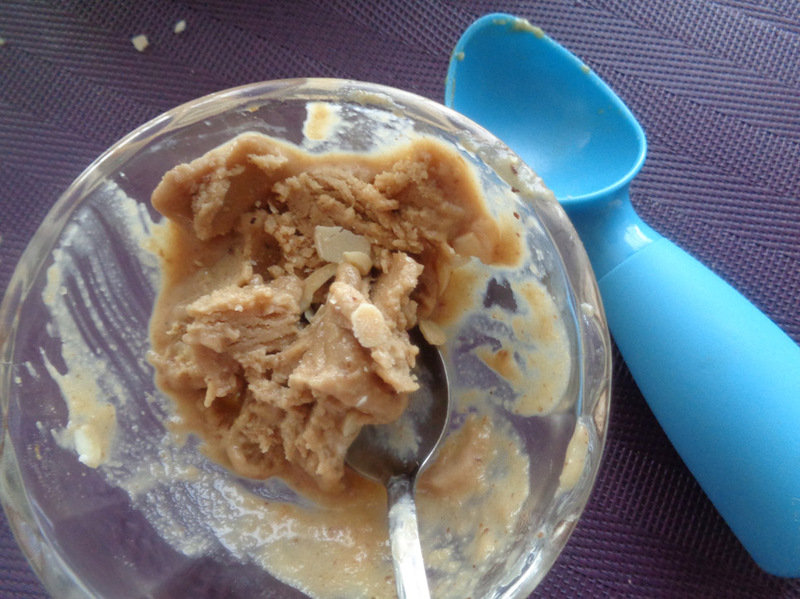 Check every 90 minutes and churn the content of the bowl either using a fork or a hand blender. Mix and break the ice formations until the cream is smooth again and re-place the bowl in the freezer. Churning it twice should suffice but, 3 times is better. 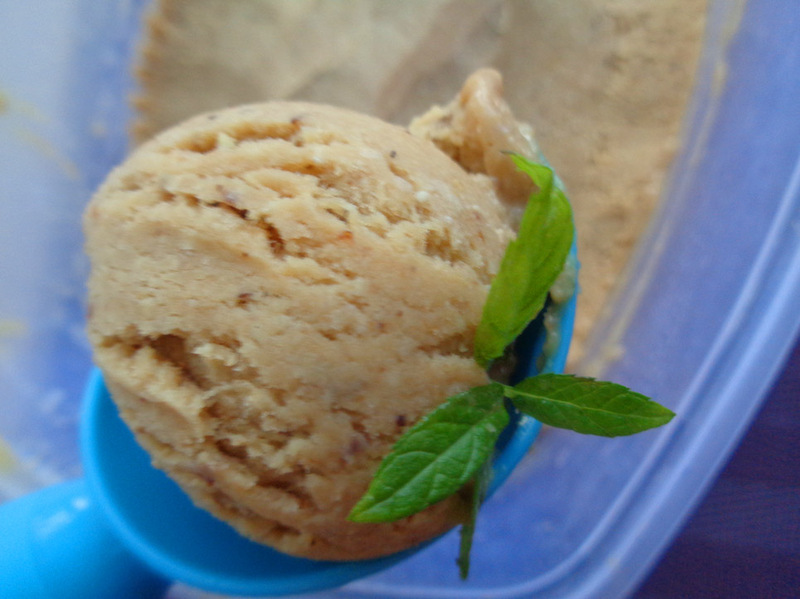 Plan to make the iced cream at least 5 hours before serving time. I served mine with a brownie as shown below. Recipe for vegan brownie here. The great thing vegan food is that provides more space for tests and trials. So, have fun. Look forward to seeing what you have made. Cost: The cocoa cost £1.79/250g in LIDL. 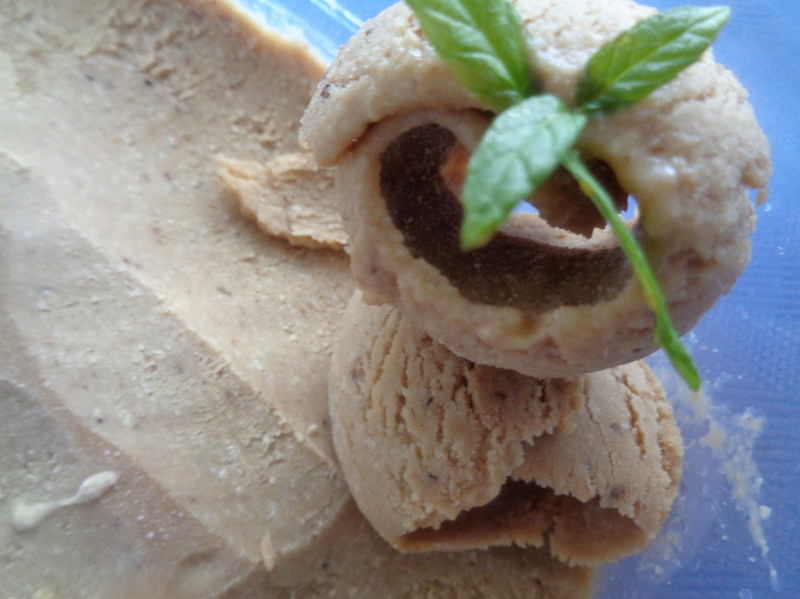 The soya butter costs £1.60 for 500g in any large supermarket, but often on offer at £1.00 in Sainsbury’s. The golden syrup costs £1.18/450g. If you are in a meat and dairy free household you should have most of the items listed. If not, note that they can ALL be found in all regular supermarkets. 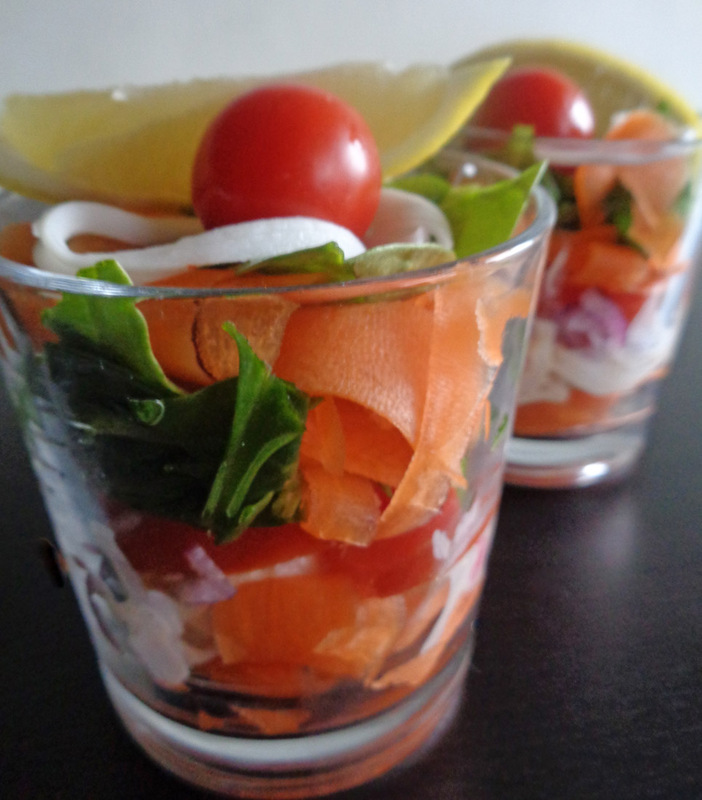 If you are not vegan, this recipe is worth a try… few people got fooled. Total cost £1.21 or £0.20 per person. Heat the oven at 160°C. Place the oats in the oven to toast until brown. 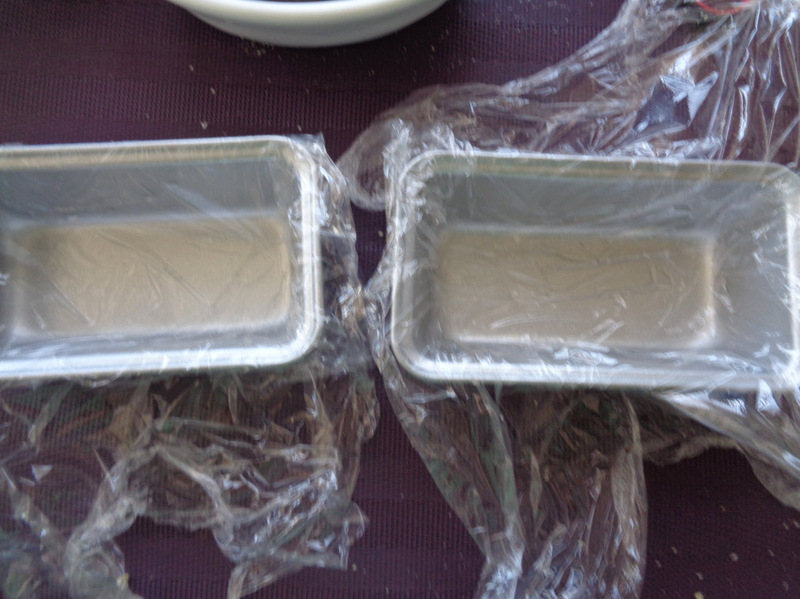 Prepare the baking tin by spreading the butter on the tin, then cover the inside of the tin with baking paper. Make sure to tuck the paper in every corner and sides of the tin then, spread more butter on the paper. The butter spreaded in the bottom of the tin will allow the baking paper to seat perfectly in the tin and the butter spreaded on the paper will prevent the cake from sticking on the paper. In a bowl, mix: sugar, milk, salt, golden syrup, stir to combine well and set aside. Place 175g of butter in a heatproof bowl and melt in the microwave for 1 minute and half. 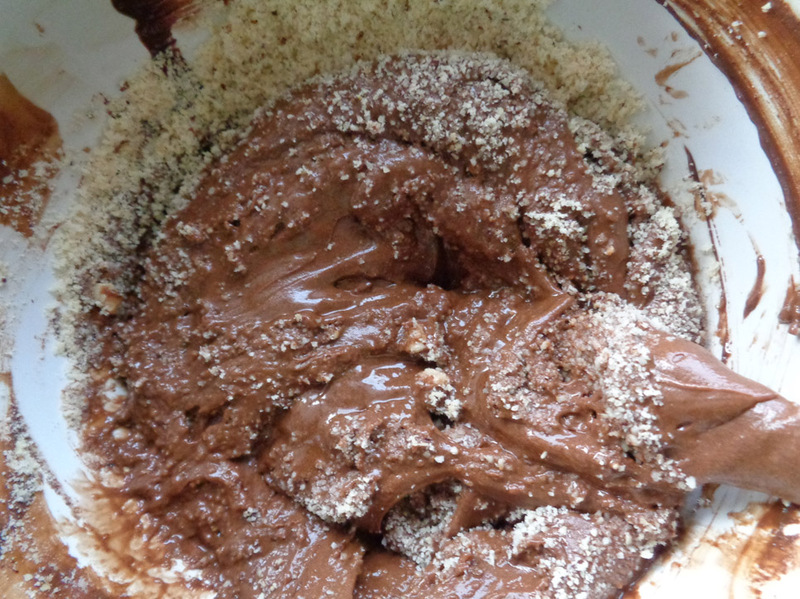 Pour the butter in a mixing bowl and sieve in the cocoa powder. With a spatula, stir the mix until the chocolate and butter look like a well combined sleek cream as would a melted chocolate tablet. 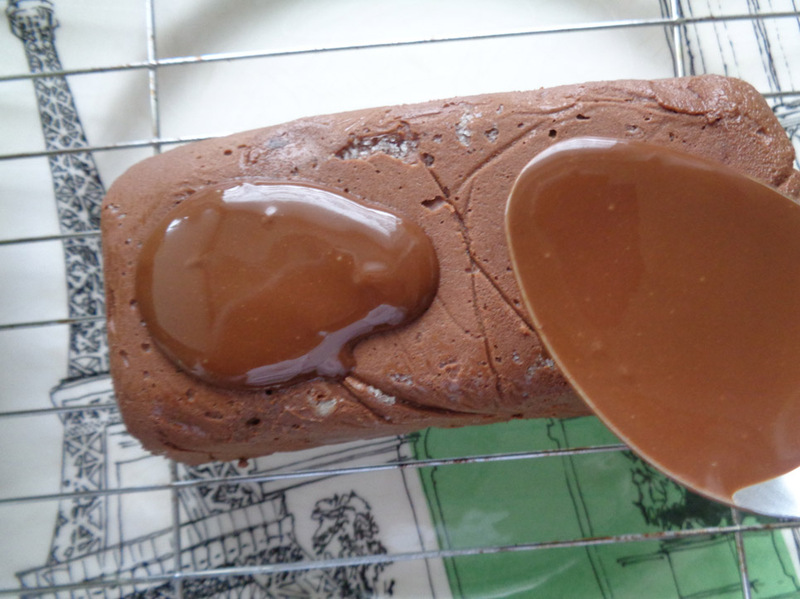 To the now creamy chocolate mix, add the sugar, milk and golden syrup mix made earlier. Stir with the spatula to obtain once again a uniform mix. Now, sieve in the flour and add the vinegar. Combine again to incorporate the flour. Once you are confident that there is no lumps of flour in the batter, add the toasted oats, stir and pour the mix in the baking tin prepared earlier with the baking paper. Place the tin in the middle of the oven and bake for 15 minutes at 160°C. To test that the brownie is ready after 15 minutes. Stick a knife in the middle of the cake. It should come out dry but still slightly moist. That it perfect. If it is still wet, allow another 2-3 minutes in the oven. Once the brownie is ready, take it out of the oven and leave on the side to cool down before serving. Enjoy warm or cold with Ice cream or Alpro single cream. I served mine below with a Banana and peach Ice cream. 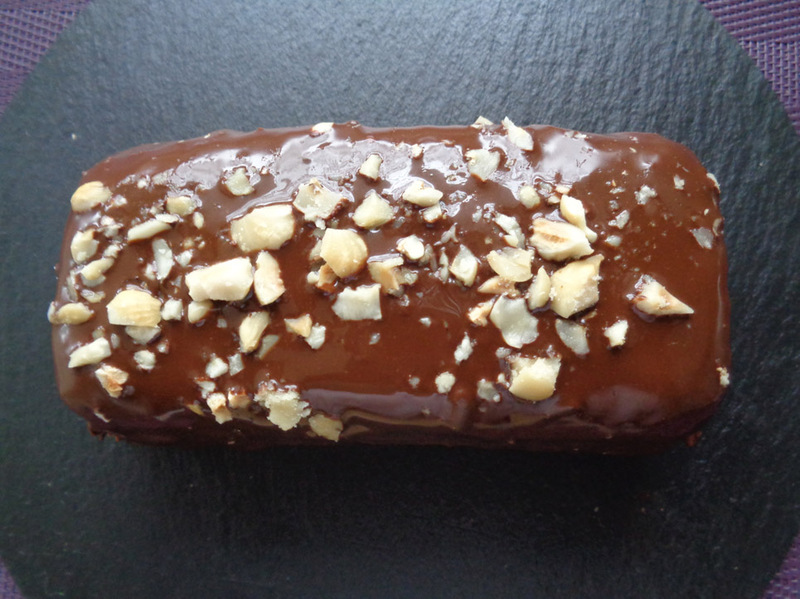 There you have it… A dairy free dessert.